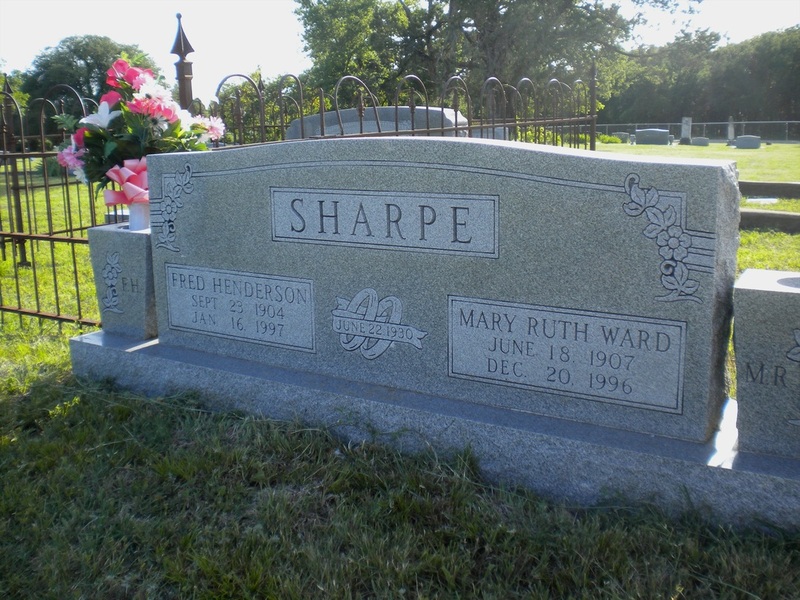 Fred Henderson Sharpe was born September 23, 1904 near Dicey and in the Godfrey Chapel community to Elam Laurens Sharpe and Ola Godfrey Sharpe. Fred went to school and graduated from high school at Dicey. He lived on the farm and worked with his family until 1926, when he went to work for his uncle, Charlie Sharpe, in the grocery store, in Weatherford. In 1929 he went to work at Mrs Baird’s Bakery in Fort Worth, Fred was the second cashier at the bakery. He took a bread route and delivered to Gainesville and all small towns between Fort Worth and Gainesville; he did this for four years and then had a route in the city of Fort Worth until 1944. On June 22,1930 Fred married Mary Ruth Ward, they were married by the late J.C. Grimes, a Methodist minister. Mary Ruth is the daughter of Lee and Maude Ward and was born June 18, 1907. She went to school at Wright, Weatherford High School and attended North Texas State Teachers College in Denton. She served a few years as a teacher in Parker County. The Sharpes have two daughters and six grandchildren; Leola was born August 24, 1932 at the Methodist Hospital in Fort Worth. She attended elementary school at George C Clark in Fort Worth, graduated from Weatherford High School, attended Weatherford College and graduated from North Texas State University. Leola worked as Home Demonstration Agent in Bosque County and there she met Jack Yelken from Franklin, Nebraska. They were married September 24, 1955. Their children are: Mark born in Craig, Colorado; Douglas was born on his great grandmother Sharpe’s birthday, and Linda was born on her great grandmother Ward’s birthday. Doug and Linda were both born in Bartlesville, Oklahoma, where the family has lived for 19 years. The other daughter is Freda Marilyn and her birthday is February 25, 1937. She was born at the Methodist Hospital, Ft Worth; and went to school in Ft Worth in the first grade, then we moved to Weatherford and she attended school at T.W. Stanley and graduated from Weatherford High School. Freda worked at local stores at vacation time and worked one summer as secretary to attorney Harry Hopkins. Freda married Don Campbell August 30, 1955, after marriage she worked in Civil Service at the Air Force Base in Panama City, Florida. They have three children; Scott born in Panama City, Florida, Terry born in Phoenix, Arizona, and Donya born in Port Arthur, Texas. They have lived in Abilene, Texas, Lawton, Oklahoma and now live in Colleyville, Texas. In 1944 Fred decided to go in business for himself and moved his family to a place that had once been owned by Mary Ruth’s grandfather Isbell and was later owned by her great grandfather Worley Patterson. We started improving the rundown place by first drilling a well, building fences, terracing land, building diversion ditches, pushing brush and sowing legumes for soil building. We built a dairy barn, bought cows, some for as low as $40.00 and started milking, selling whole milk. We did this for nineteen years, farming enough to have hay and grazing fro the cattle, selling the calves, still doing some farming in 1979. The Sharpes are members of Couts Memorial United Methodist Church. Fred is in the official board and has served in this capacity since 1946, he also taught a fifth grade Sunday School class. Mary Ruth has been President of the Methodist Women and taught in Sunday School for many years.